This list of top fireflies treks near Mumbai covers the top destinations around Maharashtra where you can spot fireflies. Head out to Prabalmachi, Rajmachi, Kondane, Kalavantin, Kothaligad, Bhandardara, and more for great fireflies trekking in India. Every year, just before the onset of the monsoon, millions of fireflies appear in the lush Sahyadris, lighting up the green forests and slopes, and turning a fun camping night into a magical experience. You’ll spend the day rambling around the Western Ghats, and will head into the forest at night to catch the glowing dance of fireflies. A fireflies trek near Mumbai is an experience like no other! Fireflies trekking near Mumbai: Fireflies trek in PrabalmachiHead to one of the most iconic forts near Mumbai. The Prabalmachi-Kalavantin climb is a thrilling one, where you’ll climb to a flat plateau at a height of 2300 feet to enjoy the views all around. At night, after dinner, you’ll go for a walk to spot the fireflies. Some itineraries include an exciting climb on the craggy Kalavantin pinnacle, and will return by evening to Mumbai. This fireflies trek near Mumbai is a great experience for nature-lovers. Rajmachi fort is one of the most popular treks around Mumbai and Pune, and has plenty to offer. But the Rajmachi fireflies trek is even more fun. You’ll enjoy an evening in the midst of nature, but the highlight is the exploratory walks in the dark forest to see the dancing fireflies. This Rajmachi fireflies trek is a great way to start off the monsoon treks season. Fireflies trekking near Mumbai: Fireflies trek in Kondane cavesThe Kondane caves trek is super fun at any time of the day, but head there for the Kondane fireflies trek for a surreal experience. You’ll wander through these ancient Buddhist caves at night, feeling like Indiana Jones with your flashlights and headlamps switched on. As you explore the wilderness outside, fireflies fill the air with their glowing light. This Kondana fireflies trek is a super-fun adventure! If you’re up for the challenge, take on the Kalavantin pinnacle climb on the Kalavantin fireflies trek. You’ll spend a magical evening exploring the forests and watching fireflies, before heading to bed in your tents. The next day you’ll head up to the breathtakingly narrow path up the towering pinnacle of Kalavantin. This Kalavantin fireflies trek is not for the faint-hearted, and is suitable for those with some trekking experience. Visit Kothaligad fort for a fun night of camping, and one of the best fireflies treks near Mumbai. You’ll head to this famous fort near Karjat for an easy trek to the top, from where you’ll get great views of the rolling land around. You’ll explore the lush green forests filled with fireflies, and will spend an evening out in the wild. The next day, after exploring the fort, you’ll hike to the fort to explore the ruins, and then return to Mumbai. 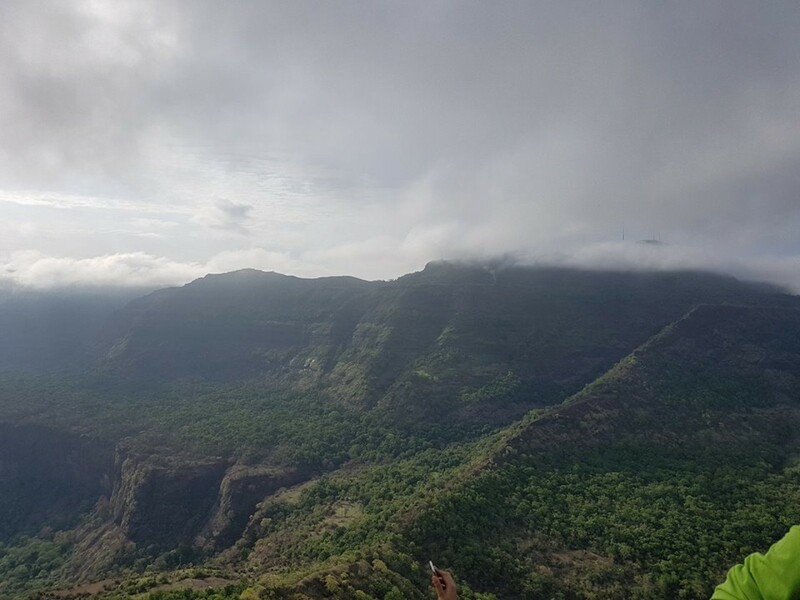 This Kothaligad fireflies trek is an easy one and is suitable for kids too. 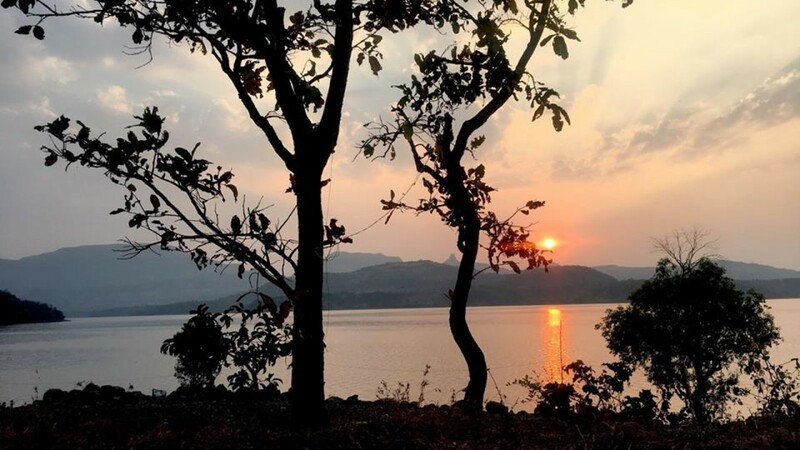 If camping by a lake, with a campfire in the evening is your idea of a fun trip, this Bhandardara fireflies trek is perfect for you. You’ll arrive at this lakeside campsite in time to watch a spectacular sunset, and then sit back and watch as the glowing fireflies fill the sky around. You’ll also enjoy a campfire and hot dinner before retiring to your tents at night. This Bhandardara fireflies trek will give you an unforgettable night! The season for fireflies trekking in India is just before the monsoon, when the pre-monsoon showers have turned the Western Ghats green, but the torrential downpours have not yet started. This gives you a short window of about 2-3 weeks to enjoy all the fireflies treks near Mumbai. When you go, carry a change of clothes, extra socks, slippers, dry snacks or energy bars, insect repellent, and of course, your camera. Make sure you pack everything in your backpack in plastic bags, and keep your raincoat handy.